This internet-only lesson originally appeared on Guitar One magazine's web site as the first of three shred lesson installments run in conjunction with G1's March 2000 issue. The lessons were removed from G1's server March 2002; I've been given the rights to reprint 'em here! That issue included extensive interviews with three of shred's most prized pickersPaul Gilbert, Yngwie Malmsteen, and Joe Satrianiand is still available as a back issue. Back in the day, what was your approach towards developing your picking hand? Paul Gilbert: The right hand picking stuff did not come naturally to me. I'd played for about seven or eight years and really had no significant picking technique, it was all a lot of hammer-ons and pull-offs. And what it took was learning to use the metronomeslowing a repeating powder down to such a speed where I could do it perfectly, then slowly speeding it up. And it was really inspiring to see that work. I learned a real simple, six-note picking lick on one string [plays Fig. 1], and within a couple weeks I could play it really fast. And the improvement was quick enough where it was exciting for meknowing that one day I could play it at this speed, and the next day I could play it faster. And I could feel it in my hands; the confidence and authority was building up. When you practice a lick that involved switching between two strings, if you're playing with alternate picking, which I do, you have a choice to either go down-upwhere your pick works outside the stringsor up-down, which would be inside. And really, when you do a full ascending / descending scale with alternate picking, you have no choice but to do both; they both occur. But if I'm doing just one little set pattern, I tend to use outside picking. Of course there's also the real crazy string-skipping ones [plays Fig. 3], and those also relate real well to the outside picking. Outside picking really makes string-skipping a million times easier because you don't have to worry about accidentally hitting the strings that are in-between the skips, because you're going outside of them. I do something real similar to that in the song Poison Eyes, and I pick everything except for the descending notes on the high E string. I noticed you occasionally use a string-skipping approach with pentatonic shapes. Paul: For the string-skipping pentatonic stuff, the one I use all the time is pretty easy to visualize because it sort of relates to an Am7 shape, but it's played three-notes-per-string [plays Fig. 4]. I'm just beginning on the low C [15th fret, 5th string] and then messing around up high with a tapped slide. These things can only be done when you're sitting down and your chin is about six inches from the neck [laughs]. If you're standing up doing the Sid Vicious, it's a little tough. Do you have any chromatic exercises that you practiced to work on right/left hand synchronization? Paul: Most chromatic things I do are little in-between things; I see chromatics as sort of a little step ladder into a note you want to hit, like in this bluesy lick I stole [plays Fig. 5]. To me, if I'm going to do an exercise, I want it to be as fruitful as possible. So, if at the end of the day the exercise can be musical, it's an extra-added bonus. There is something I call the Ace Frehley scale, which uses chromatics. 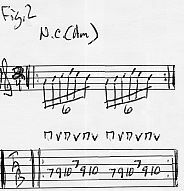 This one's all A minor pentatonic (A-C-D-E-G), but it's got the blues note [i.e., flatted 5thEb/D#)] and the major 7th [i.e., G#] in there [see Fig. 6]. When I first figured out solos, I learned a lot of KISS stuff. Now I use that all the time, but for stuff like this [plays Fig. 7]. What kinds of things inspire some of your scarier licks? Paul: For me, learning classical things really has always been motivating for learning new techniques. You can hear it on some of the Racer X things, and on Gilberto Concerto [from Pauls Flying Dog solo album]. And this [plays Fig. 8] is sort of like the end part in Bach Rip-Off [a.k.a., B.R.O., from Racer X's Technical Difficulties], and it's a really sick lick. It's all straight E minor (E-G-B) arpeggios. 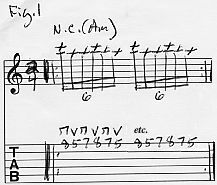 It's three sets of ascending sextuplets, but I use the open strings to give my left hand time to get up to the 12th fret to do two notes on the G string, then I do my full string-skipping pattern.